This is my favorite piece of video ever. 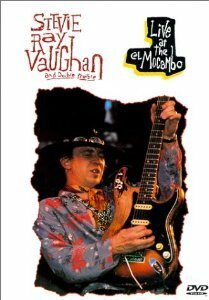 Stevie Ray Vaughan is my favorite guitarist of all time, and this DVD shows him in his prime, clobbering a 1983 Toronto audience with his kick-in-the-gut tone and transcendent musicianship. Check out “Texas Flood,” you can tell from his face that he’s left the building and is pulling those sounds from another world. This is the mother lode of Led Zeppelin video footage after so little was ever previously available. It holds four hours of live music on two DVDs from several different concerts between 1970 and 1979. These fellows had a musical telepathy that was obvious in their recordings and magical when witnessed on video. I can only imagine what it was like to be there, but this is the closest we’ll ever get now. And Jimmy Page is a wizard. If you’re learning to play electric guitar, you must watch this. This is Jimi Hendrix’s entire legendary 1969 Woodstock performance where he played his rendition of “The Star-Spangled Banner,” one of the greatest instrumental political statements ever made. Hendrix is at the height of his fame, and he delivers. With his enormous hands and hyper-creative spirit, he had a certain power over the instrument that no one else has ever displayed. I got this DVD when I was in high school, just a couple years into playing guitar. This was my first experience with the virtuosos: Joe Satriani, Steve Vai, and Eric Johnson. If you’re looking for the flashiest, most technically brilliant electric guitar playing (and you’re not too put off by leather pants), you’ll find the G3 concerts delectable. This DVD features a few songs from each player’s set in a 1996 concert, during the first of many successful G3 tours. All three players take the stage at the end for trueling pyrotechnics. This is from the 2003 G3 tour (I witnessed their stop in Los Angeles when I was in college! ), which added the king of neoclassical shred, Yngwie J Malmsteen, along with mainstays Joe Satriani and Steve Vai. Vai was at his ungodly best during his extended triple-neck introduction. That piece gave me all the chills when I saw him play it live. Joe and Steve are still on board for this 2005 version of G3, but say hello to the frightening John Petrucci of the prog metal band Dream Theater. I was already a fan of Petrucci’s when he joined the G3 tour, so I was really excited to see what he’d bring. He brought the chops. And drummer Mike Portnoy, also from Dream Theater, my favorite rock drummer in the world. Speaking of Dream Theater, this 2000 concert is the DVD that made me a fan for life. I watched it over and over in my college days until I could follow along with all the silly rhythms and impossible time signatures. As a guitarist, I connect most with Petrucci, but Portnoy is one of the best drummers in the world, and John Myung is one of the best bassists in the world, and Jordan Rudess is one of the best keyboardists in the world. (James LaBrie is a phenomenal vocalist as well, but I usually tune him out. Sorry James!) Every individual in the band will blow your mind. Now imagine what you get when the whole is greater than the sum of its parts. When you browse through the greatest albums in the history of jazz, you don’t encounter too many guitarists. There are swarms of jazz guitarists if you dig deep enough, but the genre tends to be dominated by horn players and pianists when it comes to household names. This series highlights a few tunes each from some of the greatest jazz guitarists: Wes Montgomery, Joe Pass, Barney Kessel, Herb Ellis, Kenny Burrell, Grant Green, Charlie Byrd, Jim Hall, Tal Farlow, Pat Martino. Also check out Volume 2 and Volume 3. These three titans of jazz fusion did an acoustic album called Rite of Strings at the end of this 1994/95 tour. I fell in love with the album first. When I found this DVD, I discovered that watching them do it live is even more heavenly and entrancing. Di Meola, the guitarist of the group, has made his mark in many different styles over the years, and he’s one of my favorite players overall, but this kind of untouched raw acoustic setting is where I appreciate him most. You thought nothing could creep you out more than The Wall? Watch this. In 1971, Pink Floyd traveled to the ruins of Pompeii, Italy to film a concert in an empty 2,000-year-old amphitheater. It’s downright unsettling. Steve Vai is kind of a weirdo, but his playing is so silky smooth and perfect, I just can’t resist. In this 2001 concert, he puts on a flawless show with a fantastic band. This is Satriani at his best in 2000: nasty blues textures, slippery legato lines, and gut-thumping rock. Wow! I loved Eric Johnson from the first G3 DVD, but this is raw! The concert was in 1988, the beginning of Eric’s fame, and he doesn’t hold back. His “Cliffs of Dover” improvisation is insane! This 2002 show in Detroit is brutal. Wylde can pinch many a harmonic, but he can also wail like Di Meola every time he takes a solo. Dig the wall of eight Marshall stacks. Language unsafe for young’uns.